Senior Justin Martin, who missed all of last season with a hip injury, hit a two-out, two-run homer in the bottom of the seventh inning as Pascack Valley pulled out a 5-4 win over Demarest on Wednesday. HILLSDALE – Pascack Valley was staring an 0-2 start to the 2019 baseball season square in the face. 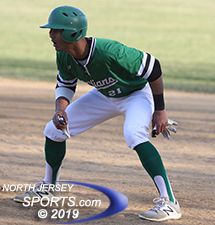 The Indians, who were shutout in the season opener on the road at Northern Valley/Demarest, were trailing in the return leg by a pair of runs with two outs in the bottom of the seventh inning. And then Justin Martin got a fastball over the inner half of the plate. That he did and Martin, a switch-hitter batting from the left side of the plate, crushed a two-run homer that not only cleared the centerfield fence by also careened into the school building behind it. 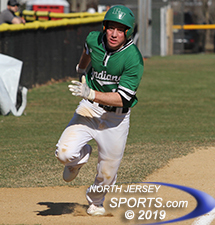 That blast tied the game and, two batters later, Dan Scachetti rocketed a two-out, run-scoring double that completed the comeback as Pascack Valley walked off with a 5-4 win on its fortress of a home field in Hillsdale. Senior Joe Argenziano threw five solid innings for Demarest, which is now 1-1 on the season. Even though there was a total of nine runs scored in the game, it certainly felt more like a pitcher’s duel as PV’s John DeMartini (4+ IP, 2 R, 2 ER, 4 H, 5 K, 2 BB) and Demarest’s Joe Argenziano (5 IP, 2 R, 1 ER, 4 H, 3 K, 4 BB), a pair of right-handers, kept the respective offenses in check during their extended stints on the mound. Pascack Valley’s first batter of the game, centerfielder Ryan Novakowski, singled and came around to score on Jake Williams’ one-out double, but Argenziano, who will play next season at New York University, quickly settled in. He worked scoreless frames in the second, third and fourth innings and gave up just an unearned run in the bottom of the fifth after a one-out error, a walk and an infield single loaded the bases for Sean Duffy, whose sacrifice fly tied the game at two. Demarest’s first two runs came courtesy of Miles Chamberlain, the No. 9 hitter who can fly around the basepaths, drew a walk, stole second and scored on Nick Argenziano’s two-out single in the top of the third. Chamberlain, a left-handed hitter, was at it again in the top of the fifth when he slapped a looping liner over shortstop and kept running as the ball eluded the dive of Scachetti in short leftfield. Chamberlain wound up with a triple and he scored on a Jackson Hecker groundball to give his team the 2-1 lead that PV erased in the bottom of the inning. 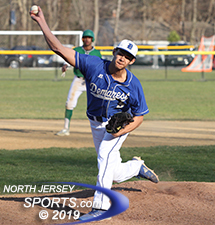 It was a battle of the bullpens in the latter innings as Josh Schiffman threw two scoreless frames for the Indians and senior Corey Felder retired the side in order for Demarest in the bottom of the sixth. The Norsemen got something going with one out in the top of the seventh when starting shortstop Ethan Rothstein reached on a one-out error and Joe Argenziano reached on a single to left. Ryan Novakowski scored the first run of the game for Pascack Valley, which evened its record at 1-1 on the season. Senior Thomas Reilly, a three-sport athlete and Demarest’s starting catcher, then cracked a double to centerfield to give Demarest the lead and Felder lifted a sacrifice fly to make it 4-2. Both runs were unearned against Jason Schiffman, who got a called strike three to escape any further trouble. That left Pascack Valley with only three outs left and it burned the first one quickly as Felder got the leadoff hitter to line out to Chamberlain in rightfield. Jake Williams drew a one-out walk before another flyball to right field left it all on the shoulders of Martin, who rose to the challenge with the two-run bomb. After Martin circled the bases, a whole new set of variables came into play. The sun was sitting low behind the first base dugout, extra innings were looming, it was nearly 7 p.m. and it was almost time to start thinking about how long the game could go before darkness put an end to the festivities. It never got that far as Duffy drew a walk and was replaced at first base by Craig Sodano, a speedster who, with two outs, was off at the crack of Scachetti’s bat. The ball rolled to the fence just to the leftfield side of straight away centerfield and Sodano dove in well ahead of the tag at home plate to give Pascack Valley the come-from-behind victory, its first of the season that evens its record at 1-1. The loss was a tough one for Demarest, which could have gotten off to a 2-0 start with a season-opening sweep, but in the grand scheme of things, a split with Pascack Valley with each team winning on its own home field is not a bad way to kick off the new campaign. The Norsemen are led by a talented and deep senior class, they have the cousins Argenziano, both heading to NYU to play baseball, at the top of the rotation and high expectations for what is to come over the next two months.